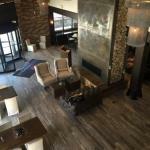 Offering a sun terrace and a ski pass sales point Firebrand Hotel is located in Whitefish in the Montana Region. The hotel has a fitness centre and ski storage space and guests can enjoy a meal at the restaurant or a drink at the bar. Private parking is available on site. Rooms have a flat-screen TV with cable channels. You will find a coffee machine in the room. All rooms come with a private bathroom. For your comfort you will find bath robes slippers and free toiletries. Firebrand Hotel features free WiFi throughout the property. You will find a free airport shuttle service at the property. The hotel also offers bike hire and car hire. The nearest airport is Glacier Park International Airport 12 km from the property.